If you’ve welded two pieces of metal together, chances are you’ve used equipment from ESAB, a business unit of Colfax Corporation. 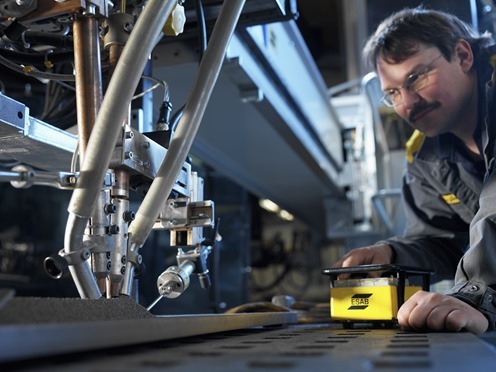 Started in Sweden in 1904, ESAB was acquired by Colfax in 2012, and offers a broad portfolio of welding, cutting, and gas management equipment to customers in virtually every industry across the globe including agriculture, building construction, energy, light and heavy manufacturing, transportation, and even medical and hospitals. Wherever things are made, ESAB is there. With the evolution of the Internet of Things (IoT), Colfax saw an opportunity to transform its businesses. What was unique about Colfax’s IoT initiative – named Data Driven Advantage (DDA) – was their vision of enabling customers to leverage the extensive ESAB portfolio. Many of ESAB’s customers manufacture highly configurable products like tractors, mining equipment, wind towers, and agricultural feed tanks. Imagine the complex process steps involved. First, hundreds of metal pieces are cut and placed on shelves. Then the parts move through the factory. At each step, there is labor required to set up a machine, fuse or cut parts, check for quality, and prepare for the next job. Workers grind metal, weld parts, and refill filler metal. Welds are documented extensively, often manually, for traceability in critical applications like shipbuilding where the paperwork can literally fill a shipping container. “If customers can leverage the broad ESAB portfolio of welding equipment, power supplies, filler metals, welding tips, mechanized cutters – even helmets, gloves, and protective gear – in a connected way, they can gain incredible insights across their entire manufacturing processes,” explained Ryan Cahalane, Vice President of Digital Growth, Colfax. Similarly to other companies, Colfax ran into challenges on its IoT journey, including educating executives, dealing with legacy products, ensuring their IoT solution integrated with existing distribution channels and sales teams, and a lack of coordination and inconsistent technology choices across business units. After years in pilot purgatory, the company accelerated their digital growth success when they refocused on their core differentiation, gaining efficiencies from having a common technology platform across businesses, and leveraging ESAB’s deep application expertise and wide portfolio to unlock value for their customers. As part of this refocus, the company exited the business of developing a custom IoT platform. They selected PTC Thingworx for Azure and the Microsoft Azure IoT platform. “Deploying ThingWorx for Azure provides businesses like Colfax with a much more holistic offering around digital transformation,” said Ron Salvador, Senior Director at PTC. The re-platforming started in December 2017, and by the HMI 2018 event, ESAB had a field-ready prototype of WeldCloud™ based on Thingworx and Azure that they began testing with customers. By FabTech in the fall of 2018, they had expanded the portfolio to include cutting applications with CutCloud™ and began rolling out the common Thingworx/Azure reference architecture to other business units’ products like orbital welding and gas monitoring. As ESAB moves forward, it plans to continue focusing on partnerships that deliver customer value, having seen success from close relationships with Microsoft and PTC. “We are taking a page out of the Microsoft playbook,” said Cahalane. “The world is a different place. It’s moving fast. Competitors can become collaborators, and collaboration is key.” The company will continue to expand its Data Driven Advantage initiative across its large portfolio and is now piloting the same common technology platform in its own operations. They expect that the power of standard tools, consistent data models, and modern analytics will increase their own productivity, improve quality, and potentially enable new insights by closing the loop between products in the field and the operations that make them.